I've been amassing uber shitloads of digital images over the years. 13,833 images apparently, according to the Corel Photo Album 6 catalog I recently created. Many are photographs taken with a digicam, some old prints scanned, various images I've created from scratch with Photoshop, screen captures, downloaded gifs, jpegs, pngs, bmps, tifs, graphics from saved webpages, album cover art attached to mp3s, maps icons, etc. I've been thinking about organizing them for a long time, and thinking about the various ways I'd like to be able to retrieve them so I could choose software based on the features I want. Ya know, beginning with the end in mind kinda thing. One important organizing concept is that most images fit into many categories, so it doesn't make sense to merely put them into some kind of nested folder arrangement. An index utilizing tags make more sense. For example, I have a photo of Livi playing with her cousin Stacy from xmas at my mom's house about 6 years ago. Liv's got a particularly adorable smile on her face. I might want to clip out Liv's face from this shot someday for some purpose, or I might want to build a collage of photos from xmas past, or shots of Liv with Stacy through the years, or a timeline of Stacy shots, etc. So I could tag this photo with names of the people (Liv, Stacy), the place (mom's), holiday, xmas, cute smile, 12 25 2006. And I'd like to be able to batch tag photos, for example grab all my photos from xmas this year, and add the tag xmas at once, then choose just the ones with Liv and add the tag Liv to those. And of course I want the interface of the software to look groovy, nice little shadows behind the images, ability to move the windows around and sort many ways and all that. I'd like to be able to retrieve photos by tag, and combinations of multiple tags, like perhaps all photos of Liv and Stacy. Or all holiday photos with Liv. Or all xmas photos with Stacy and Liv. 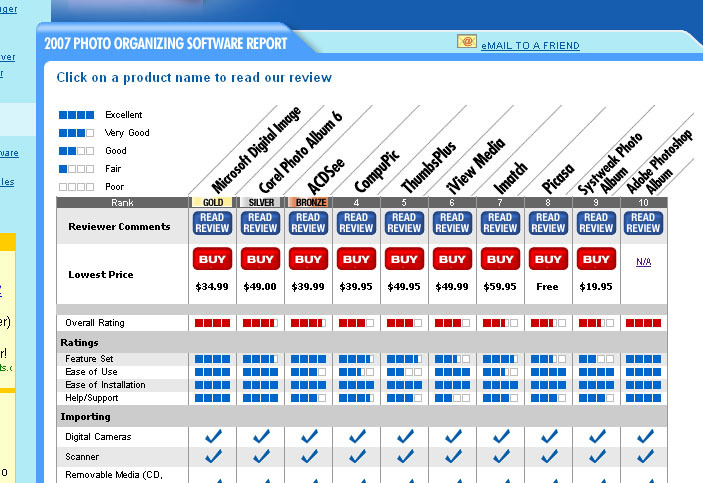 Someone is bound to have reviewed and compared the available software, right? Roight you are! And I found a pretty fresh one, too, with a lovely table comparing price, feature details, compatibility. Sweet, Vonage! (unfortunately the dang Vonage commercials have infiltrated my house, we all now follow up every interjection of Sweet! with Vonage!) So I reviewed the comparison with my criteria in mind, and downloaded free trials of the ACDSee, Corel, and Picasa programs. After dicking around with each, I think I'm going with Corel. $50 is a lot of money. I'm still waivering. But it's so groovy and does what I want, so I might actually plunk down for it.